Did you know that your relationship with food could be having an impact on your training, family, friends, community, work and even your future health? Food is a huge part of your life, whether you recognize it or not. Your attitude towards food, whether you look at it as simply fuel for training or as the enemy that makes you “need” to run more, is a critical component to running your best as food affects almost every single area of your life. Take this true and false quiz to help you gain an honest perspective of your relationship with food and how it is affecting your training and life. 1. I often skip or “forget” meal. 2. I only eat when I am really hungry. 3. I usually feel guilt after I indulge is sweet or dessert. 4. I will run or workout more if I feel like I have eaten too much or “bad” foods. 5. I have “no-no” foods, like ice cream or pizza. 6. I eat the same thing every day so I know exactly how many calories I am eating. 7. There is a perfect way to eat for everyone. 8. I almost always know how many calories are in each food I eat. 9. I never or rarely drink alcohol or enjoy dessert, and if I do, I feel guilty. 10. I can ONLY eat carbohydrates when I am training heavy. You have a healthy relationship with food. Keep eating well and enjoying an occasional treat or indulgent. Your relationship with food is fairly positive, but you need to be careful. It is important to watch what you eat, eat only when you are hungry, and stop when you are full. This helps create a more positive, healthy attitude towards food. You definitely want to get the most nutrients out of your food as possible, but give yourself a little grace and freedom to indulge once in a while. If you live too long in a place of guilt or shame for what you are eating, you can easily find yourself in the next category. Your attitude is that food is the enemy and it is working against you. This attitude, especially as a runner, can get you into trouble. A negative attitude about food may be affecting how you relate to your family and coworkers, as well as causing physical damage to your body during your training. If this category describes your relationship towards food, I would recommend signing up for a consultation with me or another nutritionist to assist you in building a healthier relationship with food that will improve your training, as well as your life. What is disordered eating – could it be you? This simple attitude quiz is not scientifically based, but it is very helpful with determining how you relate to food. While you may not have a clinical diagnosed eating disorder, such as anorexia (self inflicted starvation) or bulimia (bingeing and purging), you do want to be aware of the signs of disordered eating. Disordered eating is defined as a negative attitude concerning weight, food, and/or body shape or size that results in strict, habitual changes of eating habits. These strict changes may look like: (1) rigid eating and exercising habits that are not healthy; (2) running or working out on off days to maintain weight; (3) elimination or avoidance of entire food groups, claiming extreme allergies without diagnosis; (4) extreme mood swings specifically before or after eating; or (5) a preoccupation with food, caloric intake, and weight. Because disordered eating is a negative attitude about food, your personal thoughts can be the first thing sign that indicates you have a disordered eating problem – or that you may be on your way to an eating problem. -Beginning to enjoy being hungry or falling asleep hungry because it means weight loss. -Thinking that a specific food is the enemy and if you ever eat it you will have to run (or punish yourself)! -Soaking in external comments like, “wow, you look good” or “are you losing weight”. -If the scale does go up, you panic, become irritable, and automatically start thinking about how you are going to change what you are eating or doing. -You are constantly thinking about what you ate or are going to eat next, and if it is “healthy”, or “low in calories”. This condition of disordered eating is becoming far more common in the running world. Often runners have addictive or perfectionist personalities and they find themselves willing to do whatever it is going to take to improve their body weight, shape and running times. Due to the nature of eating disorders in our country, most disordered eating studies have been conducted on groups of women. It is estimated that 75% of women between 25 and 45 years of age, struggle with some degree of disordered eating. A 2009 report in the Journal of American College Health showed more than a quarter of female college athletes exhibit disordered eating patterns. A survey of collegiate athletes reported some 55 percent of women tell researchers they experience pressure (both external and self-imposed) to achieve a certain weight, and 43 percent say they’re “terrified” of becoming overweight. Though these statistics are not as readily available on men, male runners are often just as concerned with their body weight, shape and size, putting them equally at risk. It is estimated that in the last 30 years, male eating disorders have risen 30%. Just in the past year, I have had a number of men approach me about nutrition counseling because they recognized their eating behaviors were not healthy or normal. The best thing you could do for your training, your health, and your relationships with people is to seek help. A nutritionist can design an eating plan to fit your specific needs as a runner, as well as help you improve your outlook on food. You can train your body to crave foods if you consistently eat them anywhere other than in your kitchen. Think about it, different rooms in your home are designed for different purposes. The kitchen’s duty is to prepare and eat food. If you always eat ice cream in your bed at night, you will continue to crave a sundae, in bed, every night. Designate your kitchen for the purpose of meals only. Most of us are eating based upon external stimuli alone, rather than our own physical needs or food preferences. Many of have no idea when we are hungry or satisfied. Before beginning a meal ask yourself, how hungry am I? Rate yourself, and set the tone for how much you need to refuel in this meal. The process of chewing is a vital component of the digestive process. Healthy digestion leads to satisfaction. When you chew completely, you will be able to enjoy the benefits of food and even notice each individual taste. You may actually end up eating less because you have given your body time to signal satisfaction and fullness to the brain, this may lead to weight loss for many emotional eaters. Turn off the TV, cell phone, computer, iPad and all other electronics. If you’re eating while multi-tasking, you will miss the cephalic phase of ingestion. The brain experiences hunger, if it hasn’t experienced the taste, pleasure, aroma and satisfaction from the food. Stay present and pay attention. 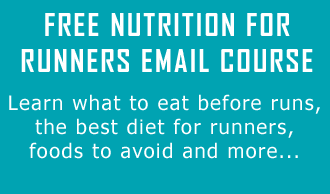 Implement these four tips or schedule a consultation with a running nutritionist to help change the relationship you have with food. Having a positive outlook on food can help you turn around disordered eating patterns and help you get off that dangerous road and back on the road to real health and improved performance. “Disordered Eating.” OHSAA Sports Medicine:. Web. 06 June 2012. Striegel-Moor, Ruth H. “A Prospective Study of Disordered Eating among College Students.” Eating Disorders 8.5 (2006). Print. Recently a book was published in Belgium where a doctor, researcher at the university advised a new food pyramid: general advice was: reduce as maximum: soda drinks, bread, potatoes, pasta, rice, fast-food, red meat, omega 6 fats etc .. and replace it by fruits, vegetables, fish, good oils, only fresh juices, eggs, … It looks logical, however when we look at the new pyramid model: bread, potatoes and rice would be worse than fast-food and red meat. He gives as explanation: sugars are not unhealthy however very unhealthy. He refers to work published by prof. C. Kenyon (university of California) The media here made a whole story out of it because different professors, food specialists and researchers they all gave completely 😉 different opinions about these statements in the book. Was wondering what they would say about this in the US……? she was 56 years old when this was filmed, so she, for one, seems to have done well without lots of sugar. I hope you find some of this information useful.